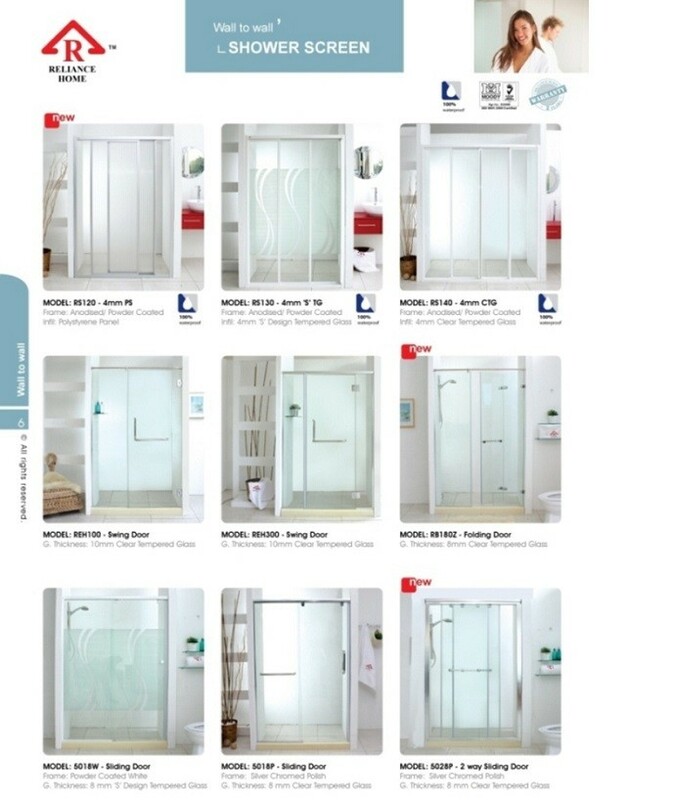 There are many ways to find your ideal shower screen. One of the method is to find a shower screen by shape. 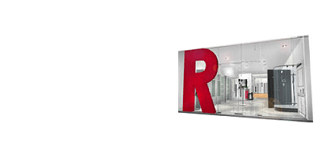 We provide Sliding Frameless Door type (REH100 /REH200 / REH300 / REH400 series), Frameless Sliding Door type(RS5018P, RS5018PL, RS5028P series), Folding Type (RB180Z and RB090R), Framed Shower Screen (RS130/RS220), Fully Stainless Steel Frameless series (KK-T72 and KK-T11). 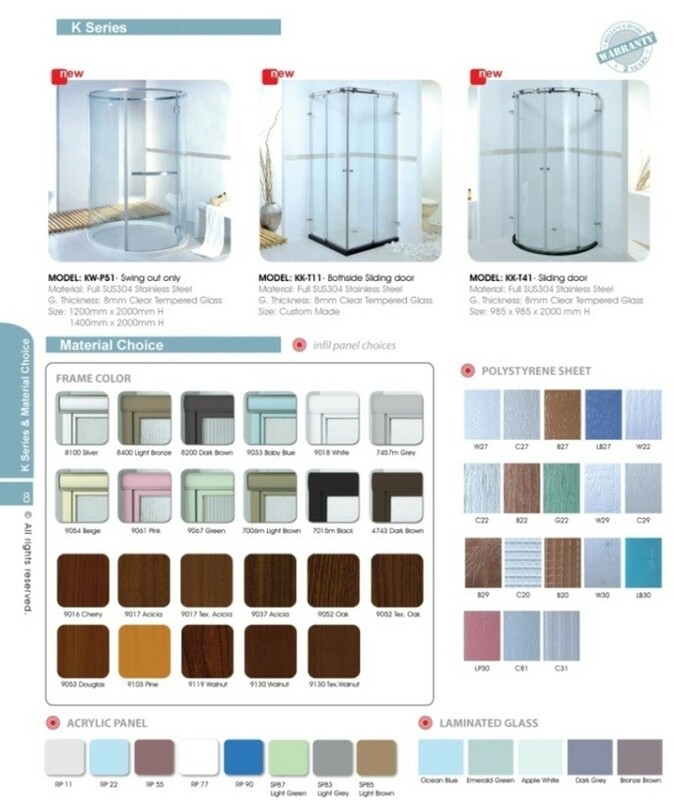 All our Shower Screen are made to order, be it Wall To Wall Shower Screen, straight line, L Shape, corner entry, Diamond Shape, Curve Shape, Reliance Home offers all shapes at all times. If you consider a durable Shower Screen for your bathroom, it will be like an upgrade to your bathroom and house decor resulting added property value. Moreover, Shower Screen are so flexible to fit in, whether the bathroom space is large or limited. Location – Should you wish to install a new Shower Screen, you may choose one that can be installed at the existing shower location, this will definitely save a lot of unnecessary money, time and labor on piping works. 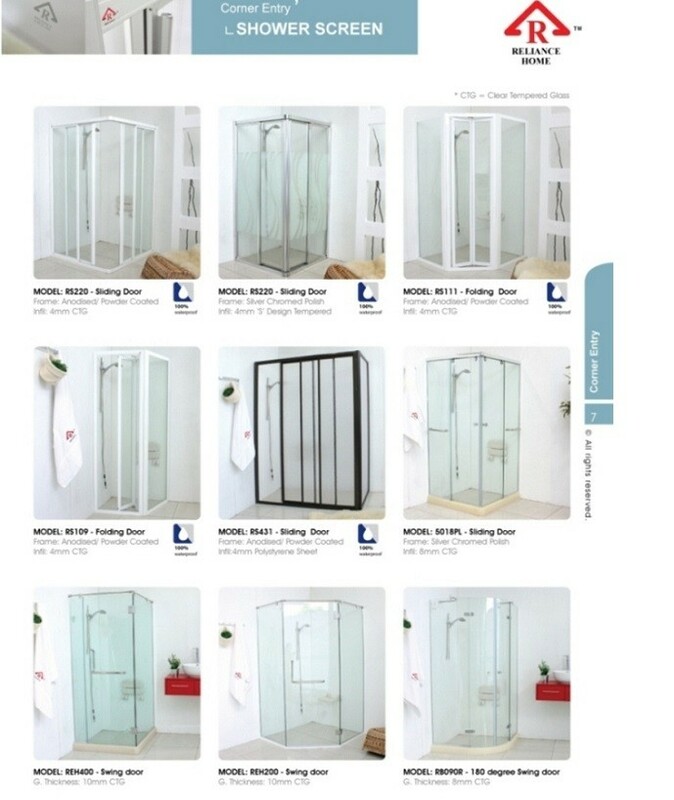 Dimensions – There are many types and shapes of Shower Screen that you can pick and choose, such as, Wall To Wall Shower Screen, L Shape (square/oblong), Diamond Shape or cubicle. In order to make a bathroom feel more airy and spacious, you must choose the one with an appropriate dimension to avoid any congestion. Anti-Corrosion Test – There are many types of fittings finishes that may have chipped or faded off, this will affect the appearance of your new showers. This is the reason why it is important to choose metal fitting that has undergone anti-corrosion tests. Door Rollers – You may neglect this fixture when buying/choosing a shower screen, but the shower door rollers are very important for the durability and quality of the Shower Screen. Therefore, we only supply the door rollers which have been endurance tested (lasting & durable). Door Handles & Fittings – Some poor quality door handles are fragile and affect the image of the Shower Screen. Whereby, solid metal is more ideal, which is stronger and elegant. Rubber Seal – To avoid water leakage, you may add an extra feature, a good seal with Rubber Seal on the shower door is very effective and moreover the Shower Screen will appear sleek and neat. Look out for the genuine aluminium frame to avoid recycled aluminium or that has mixed with other metals, which is of poor quality and not durable. In the market, there are Shower Screen framing that may look like aluminium but is of other materials like plastic, which is of inferior quality and unable to support or protect the Shower Screen glass as aluminium does. The thickness of the aluminium frame is very important in order to have the strength to support the glass and resistant to denting. Some bathrooms’ decor come with simplicity while others are sophisticated. Therefore, one must be cautious when selecting a suitable matching frame color which does not clash or contrast with the entire bathroom decor and color. Generally, it is best to have Tempered Safety Glass for your Shower Screen and the glass thickness that we supply range from 4mm, 5mm, 6mm, 8mm, 10mm and 12mm. Normal glass can be easily chipped and breakage, unlike Tempered Safety Glass which is toughed and are polished to curved edging, so no sharp edge and harmless. Alternatively, you may choose a Shower Screen with strong aluminium framing type to support and protect the glass. Tempered Safety Glass must be impact and fragmentation tested and complied with the specific glass Standard. This glass will only shatter into small fragments instead of sharp shards, so it is unlikely to cause severe injury. This sheet has high thermal resistance than other products, therefore it is a good thermal insulator, commonly used in building construction and material like structurally insulated panels and concrete including signage. It is also energy efficient, cost effective, tough, light, durable and comes in many texture designs. This reinforced material is tough, lightweight, corrosion resistant, thermal resistant, cost effective and durable. This sheet has unique properties that will not expand/contract during hot or cold weather. 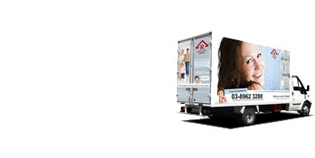 Due to its flexibility in design and fabrication, there are numerous unique and attractive graphic designs available. Reliance Home’s goal is to provide you a safe and hygienic home with diversity range of shower screen at the most affordable price. Our shower screens come in various shapes, designs and custom-made to suit your home.